Increased efficiency in Procure to Pay (P2P) / Order to Cash have come a long way within the Oil & Gas Industry. That said even with the increased adoption and benefits of eCommerce and the associated advancements in document transmission Standards we are still a long way off getting to right first time / 100% accuracy in electronic P2P documents. If we accomplished this we could not alone reduce cost further, but we could also free up resources to focus on driving further innovation and cost saving on eCommerce/P2P initiatives. The vast number of procurement strategies available to oil and gas companies has broadened—complicating analysis of the procurement function, but also offering new opportunities to innovate within procurement and mitigate associated risks. Broader capabilities also change the traditional relationship between suppliers and oil and gas buyers, often requiring greater transparency and information sharing. For many industries, the Procure-to-Pay process is relatively similar in organisations’ back offices; it mainly revolves around managing procurement, purchasing contracts, purchase orders, and invoices. In order to manage these processes as efficiently as possible, some organizations adopt a P2P software solution to achieve automation, control, and savings. For companies in the oil and gas industry however, back-office processes are very different and much more complex than those in other industries, and a one-size-fits-all P2P solution cannot handle these companies’ diverse and nuanced requirements. In oil and gas P2P, companies must consider a variety of unique factors as they handle their operations, suppliers, and business documents. These factors include industry-specific regulations such as environmental guidelines, operational reporting, and supplier qualification. For most companies, processing business documents also entails the widely-used PIDX coding standards that are specifically designed for eCommerce documents in oil and gas. Oil and gas companies also struggle with the standard pains of paper invoices and limited process visibility that come from manual P2P processes. The industry has a complicated P2P process and workflow, often involving high volumes of invoices that are tied to servicebased contracts rather than purchase orders, and that cover services involving varying quantities and types (e.g., fluctuating output from an oil well on a given day). For these reasons, oil and gas companies must code, validate, and process their invoices at higher rates than in other industries. Even as these companies seek to improve their invoice processing, many struggle to find an automation tool that fits their unique needs. In order to find technology that complies with their special process, these organizations must look beyond the normal scope of P2P automation into the niche, oil and gas-specific software market. This report explores the unique characteristics and challenges of oil and gas companies. It also explores what automation looks like for these companies when they use a niche business solution tailored specifically to their needs and those of their suppliers. 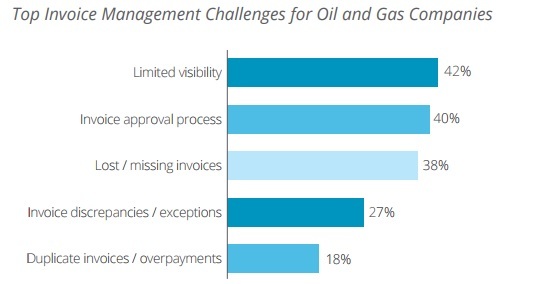 Top Invoice Management Challenges for Oil & Gas Operators and Suppliers alike. 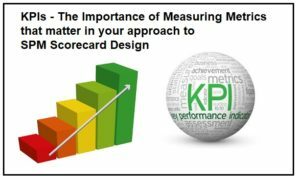 However, when a buying company is dealing with a small or technically outdated supplier that has not implemented the PIDX standards, invoice processing times lengthen and efficiency suffers. In addition to the unique regulatory and process flow challenges for oil and gas companies, companies in this industry also experience P2P pains that are consistent with manual-based processing.